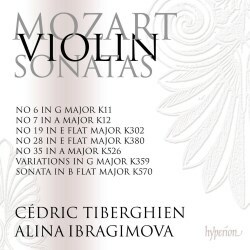 As ever with this series, Alina Ibragimova and Cédric Tiberghein present their ‘2 CDs for the price of one’ Mozart sonatas as a recital that includes relatively early works, some of the more established later and greater works, and in this case a set of variations for a little added contrast. Played with the utmost musicality and refinement, the Sonata in E flat major K380 strikes out confidently and not without some drama in the piano part and virtuoso demands from the violinist, but it is the restrained beauty of the central Andante con moto with its ‘sighing’ appoggiaturas – Misha Donat’s booklet note description – that attract the most. Mozart at his simplest and best is crowned by a joyous ‘hunting’ themed finale, the bouncing gallop of which is further evidence if that were needed that we are in safe hands with these performers. The Sonatas K 12 and K 11 saw the light of day in London just before Mozart’s 9th birthday. These both have a two-movement form and, while being utterly charming, also have some tricks and surprises that hold one’s attention. Mozart as ever is keen to buck convention, and is not content with mere fecundity of invention, taking us on little narrative excursions that set the focussed mind alight. CD 1 concludes with the Sonata in B flat major K570, a piece written as a piano sonata not long after the Divertimento K 563, with which it shares some features. Published after Mozart’s death a violin part was added to the first edition, but its inclusion amongst the violin sonatas is now known to be spurious. Armed with this information, one can hear how the violin has less of an independent role, imitating the piano, following its melodic shapes and adding rhythmic punctuations. Perhaps in reflection of this Alina Ibragimova’s playing seems more restrained than usual, the partnership less equal than in the other works. This quiet interaction makes for some magical moments, but an argument can be made for some more meat on the bones from the violin part. Commencing CD 2 with the Sonata in E flat major K302 we’re back on form in a work that sees “Mozart attempting to recreate the sound of the famous Mannheim court orchestra.” Suggestive fanfares, extended crescendi and dramatic major/minor key contrasts are all part of this illusion in the first movement, which is followed by disarmingly relaxed Rondo second movement which still holds plenty of surprises both coyly thrown in and expressively essential to the shape of the whole. The Variations in G major on ‘La bergère Célimène’ K359 are not Mozart’s most famous in this genre, but take the simple melody of the chanson into some delightful places with opportunities for both players, though the pianist certainly has the most notes. Each variation is given its own access point which is handy, and you can track the development of the music into ever more substantial and inventively dramatic realms as the work progresses, including a gentle penultimate variation in which the violin strums pizzicato chords in alternation to those on the piano. The programme concludes with the Sonata in A major K526, entered by Mozart into his thematic catalogue just two weeks after Eine kleine Nachtmusik. Mirroring the duration of K380, this bookending of the programme with the most advanced of these works creates a highly satisfying whole, and the spectacular fast outer movements of K526 guarantee a rousing finale. Some moments in the final Presto are a reminder of the great Sonata K448 for two pianos, but it is however the enigmatic central Andante that once again proves equally if not more interesting in its sinuous exploration of the sparest of material. As with previous volumes the recording for this release is of superlative quality and perfectly balanced. My remarks with regard to a comparison with the Deutsche Grammophon recording of Mozart’s mature violin sonatas with Anne-Sophie Mutter and Lambert Orkis (review) stands for this volume as they did with regard to volume 2 of this Hyperion edition (review), but with K526 for instance one can go to Artur Grumiaux and Clara Haskil on Philips from way back in 1956 (review) to hear an alternative view on this music in which the violin has a more vocal role to play in terms of expression. Alina Ibragimova certainly uses vibrato, but when integrating with the piano part this is often toned-down or relinquished entirely, leaving space for dramatic points to flourish and for moments of utter intimacy to generate their own breathless air of suspense. Ibragimova’s vibrato is perfect for my taste, being entirely within the note and a quality of expressive projection rather than a sonic constant or something ever-present and even overly wide. By no means am I accusing Artur Grumiaux of flaws in this regard, and his more intense sound brings other unique qualities to these works. To my ears however, Alina Ibragimova and Cédric Tiberghein bring us a poetic and playful Mozart that suits the present day very well indeed.